Dr. Joe Willardsen’s cosmetic dentistry expertise is featured on The Doctors television program. Get a Brighter, Whiter SmileSmile 365 is unique because it uses patent pending materials and techniques to get your teeth up to 4 shades whiter in just 7 days. Dr. Joseph Willardsen is the official dentist of the Miss Nevada U.S.A. pageant. 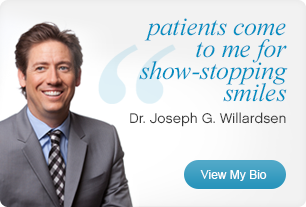 As a leading expert, Dr. Joe Willardsen and his team are frequently seen across the country. True Dentistry has a reputation for being one of the best dental offices in Las Vegas, and we strive to give you a unique experience from one of the top cosmetic dentists in the area. Dr. Joseph G. Willardsen has been trained in some of the most prestigious dental institutions in the world, and he is the official cosmetic and reconstructive dentist to the Miss Nevada USA Pageant. True Dentistry remains on the cutting edge of dental care, offering advanced treatments including porcelain veneers, teeth whitening, dental implants, TMJ Disorder treatment, and much more. Please take a look through our website to see how our experienced dental team can renew your smile, and contact us today for more information. I’ve wanted to have a major overhaul of my teeth pretty much my whole life. Dr. Willardsen was great – he met with me several times to talk about my options. He did a great job getting the natural look I was trying to accomplish. Having improved teeth really makes a difference. I believe that I am perceived as being more intelligent, better put together, and I really do believe it has had a positive affect on my job and my career.